This morning when we got up, Jean Michel called me from the bathroom whose first floor window overlooks the little wood behind our house which is part of our property. “Un chevreuil à côté du neflier”. Mr and Mrs Previous Owner told us we could see deer in the wood at dawn and dusk but this was 8.30 and unexpected. By the time I got to the window, it had disappeared behind the nearby apple tree. I dashed off to get the binoculars and was rewarded by seeing quite a large animal sprint past the medlar tree and out of sight. By the time we tried to pick our medlars last year, there were none left on the tree, but I certainly don’t mind. I’d much rather the deer ate them. Maybe next time I’ll be quick enough to get a photo. We love our little wood. Last time we were here, it was covered in daffodils. 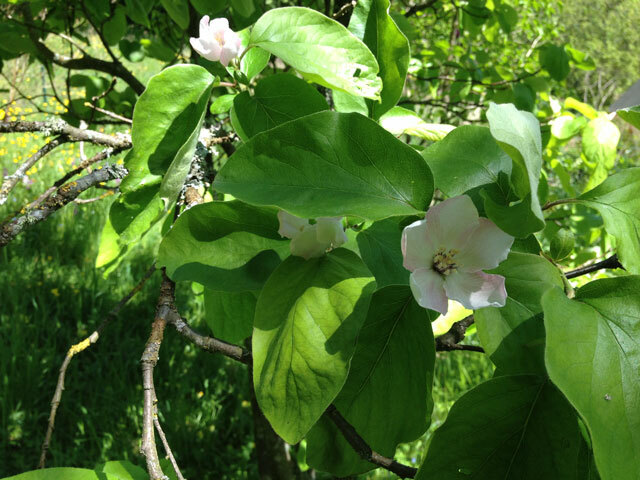 Now there our flowering apple, cherry, quince and lilac trees and decorative broom. 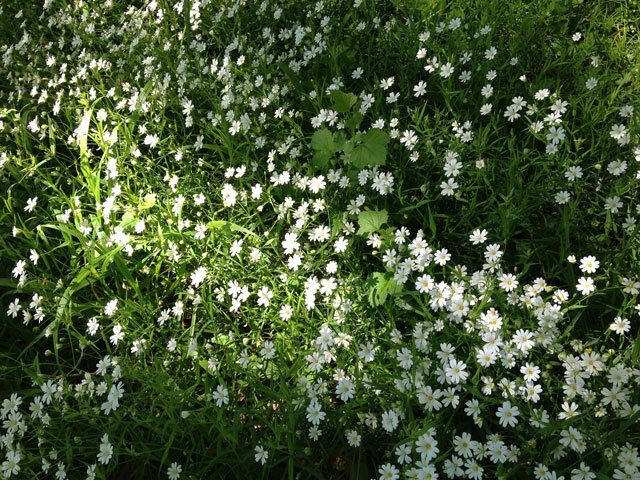 On the ground are wild Touraine orchids (two colours), bluebells, tiny white daisies, buttercups, dandelions and periwinkles. 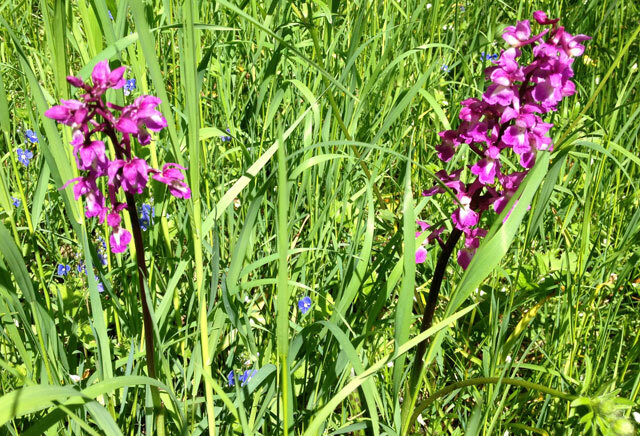 Mr Previous Owner had told us about the orchids but we didn’t see them last year probably because we didn’t know what they looked like. But thanks to Susan from Days on the Claise, this year, I’ve observed three species. At the front of the house, the wisteria is in bloom, much more impressive than last year. We’re both relieved and delighted because we were worried that we’d pruned it too late. The drive into Blois along the Loire is sheer delight at the moment with masses of wild lilac and lots of beautiful wisterias which remind me of Venice in the spring time. 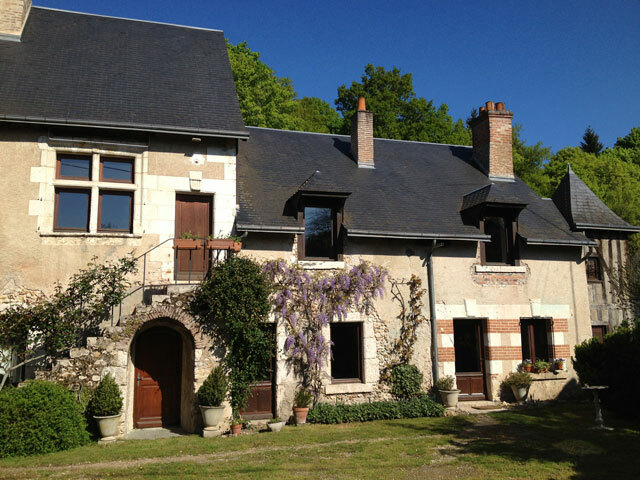 We have an enormous lilac opposite the house on the vacant land leading down to the Loire. We often park the car next to it and the scent is overwhelming. I hope it will still be in bloom next weekend so I can take some back to Paris. After spending the day mowing and weeding yesterday, we finally found time to go cycling along the Loire to Saint Dyé late afternoon. 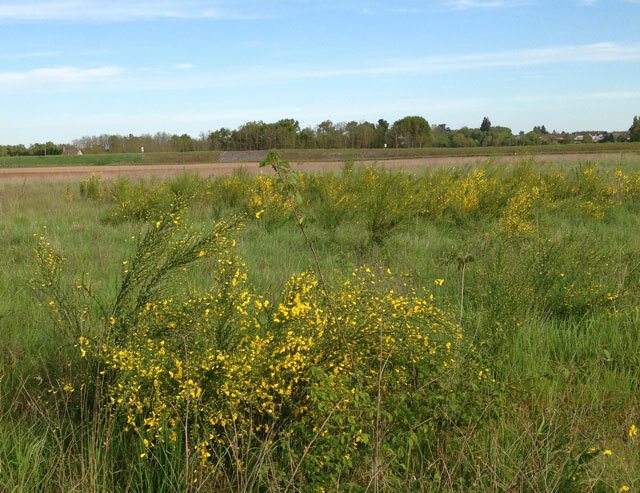 Wild broom and apple trees dotted our path. 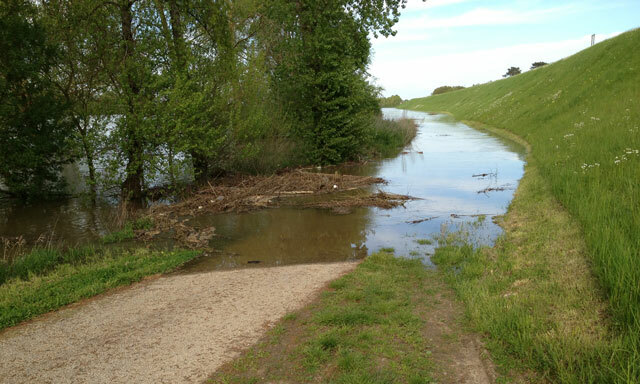 Halfway along, though, our bike path suddenly came to a stop. Jean Michel had been noticing how high the river is this year after all the rain and our path was completely under water so we had to turn back. As it turned out, I think 20 K was probably enough for our first bike excursion since last September. My sore thighs and rear end are appreciating the rest today as we drive from Blois down to Ciboure on the Basque coast, just across the estuary from Saint Jean de Luz. 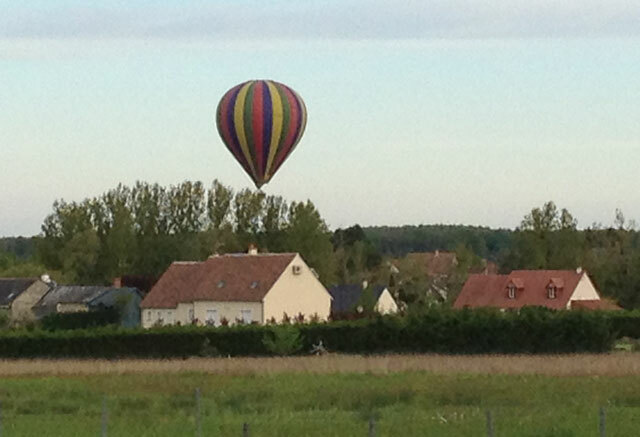 As a fitting end to the day, we went to a restaurant we’d seen in Valaire (15 minutes by car from Blois) when cycling on another occasion and on the way, spotted the first air balloons of the season. 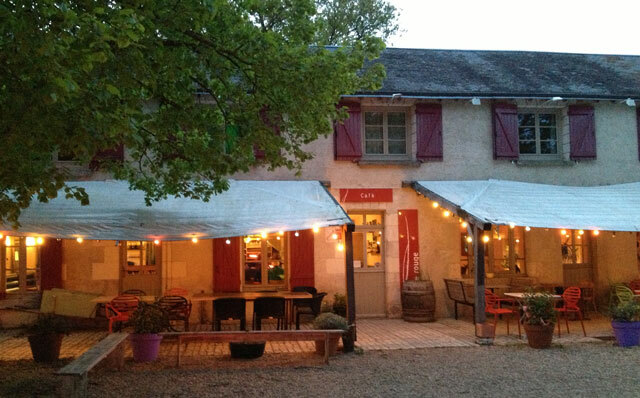 L’Herbe Rouge is just the sort of restaurant I like – unpretentious, frequented by the locals with fresh food, a touch of originality and friendly service. The waiter turned out to be English but has been here for many years. I had candied capsicums with fresh Corsican cheese while Jean Michel had avocado and prawns, followed by sirloin steak and French fries for Jean Michel and fennel purée for me as I am need to lose a couple of winter kilos to fit into my summer clothes again! Then we shared a serving of cheese cake for dessert. We chose a local chinon which we bought by the glass, followed by a decaff each. The bill came to 65 euro. I’m looking forward to going back there when the weather is warmer to eat on the terrace. 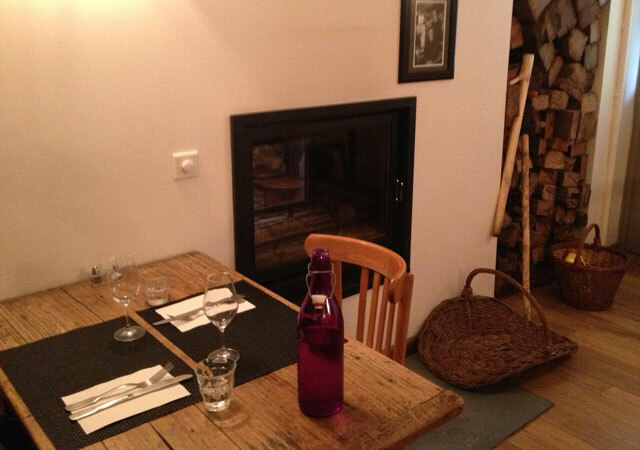 L’Herbe Rouge, restaurant and wine bar, Valaire 41120, 02 54 44 98 14. Open from 12 to 2 pm and 6 to 9.30 pm Tuesday to Sunday. Closed Sunday night (except July and August) and Monday. 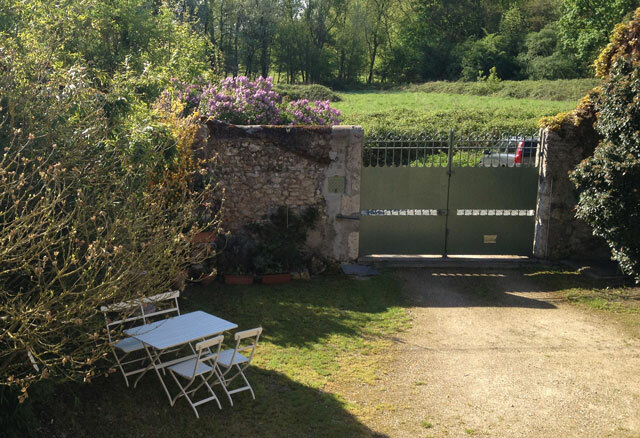 This entry was posted in Cycling, Flowers & gardens, Loire Valley, Restaurants and tagged Closerie Falaiseau, cycling, deer, L'Herbe Rouge, Saint Dyé, Valaire. Bookmark the permalink. One of my favourites is Wisteria, I had an absolutely beautiful one whenI lived in Toowoomba but they don’t do as well in Brisbane. Have never seen a Lilac tree.